We have a selection of standard designs for the centres of the rosettes which can be used, or amended by you, to suit your particular ideas. You can also change the colour and message to suit. If you wish you could also upload a photograph to us. You can do this either when you order, or later, by attaching it to an email. The centre of the rosettes are based on a 57mm badge. We can produce the rosettes with a single layer of pleated ribbon, with two layers or with three or four layers. Single layered rosettes with a photograph in the middle are a very popular option. We can increase the layers to 2 or 3, and so incorporate a selection of ribbon colours. These could be representative of a particular favourite football team. Or we can produce rosette colours representative of the colours of flag of the country that the person was born in. 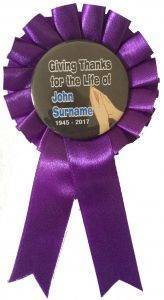 Whatever you require, we will make the funeral rosettes in our own workshop. We can therefore usually produce them within 24 hours of the order being placed. If the funeral or memorial service is taking place at very short notice then we would suggest that you select the Royal Mail Special Delivery option at checkout. This will therefore give a next working day delivery.